Beautiful product. Looks even beautiful in person. Very detailed work, each color of stone in beautiful and perfect for every day wear. Not too heavy. 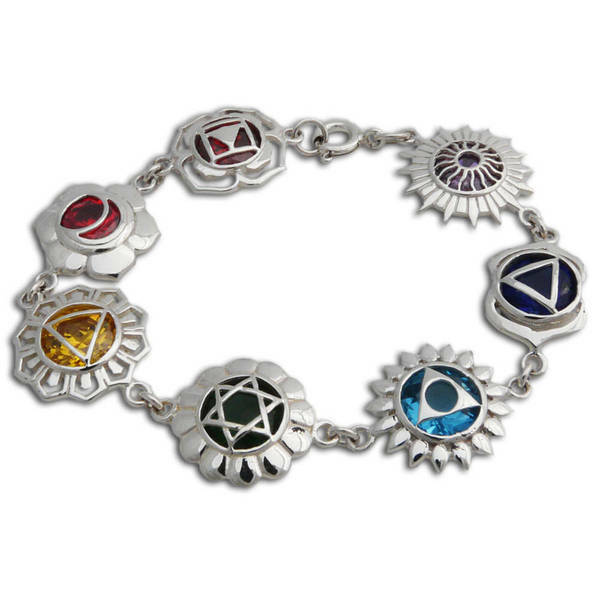 The seven chakra bracelet is beautifully handcrafted from sterling silver and features bright colors and symbols. The spring clasp keeps the bracelet secure and are comfortable all day long. You will know that you are doing good because 10-percent of the profits are donated to the Tibetan Children's Education Foundation. Conscious, ethical, charitable ...with these qualities in mind and action, we have created a fair trade business along with talented artisans committed to producing unique jewelry, positive for people and planet.This jewelry is beautifully crafted with pleasure by a small group of artisans in Thailand. Inspired by nature, spirit and love, we create the designs for people who appreciate jewelry with meaning and a story behind it while supporting advancement and sustainability. All weights and measurements are approximate and may vary slightly from the listed information. Treatment code *letter (stone or pearl type). See Gemstone Treatments for further information.